As iguanas, we usually eat a meal once a day and then maybe a few snacks also. My friends in the wild don’t eat as good as I do. Mom spoils me rotten with her famous iguana salad. Her iguana salad is guaranteed to put weight on any iguana! Out in the wild, iguanas snack on pretty much what they can find. They like dark leaves, pretty flowers, and colorful fruits. Iguanas do not eat bugs or any other living creature. Yuck! We are strictly vegan! Iguanas cannot digest animal protein and over time it will destroy our kidney function. Some iguana keepers dispute this fact but the only way I’m eating some nasty bug is if I’m starving! Mom feeds us at lunch time often because it gives us a chance to warm up under our lights and get our digestive system going before trying to eat. After we eat, we need more time under our lights, or out in the sun, to keep the digestive system going and digest all that yummy food properly. Heat helps us digest our food and UVB light helps us extract the calcium and vitamins out of the food we eat. A proper balance of food, light, and heat makes us fat and happy! Mommy makes her iguana salad fresh every few days. She uses a food processor to shred and chop all our food as small as possible. Since iguanas do not chew, they absorb the nutrients from the surface area of the food; therefore, the smaller the food, the more nutrients we can get out of it. The main food we need is dark leafy greens. We like collards, kale, mustard greens, turnip greens, escarole, and dandelion greens. We love dandelion greens, dandelion flowers, all of it! Dandelions are like iguana candy. The only dark green we do not eat much is spinach. Spinach is high in calcium, protein, and fiber but there are some other things in it that can actually keep us from absorbing any calcium. Spinach is okay as a treat but not in a daily diet. The second part of the salad is all the yummy veggies. Mom always uses some kind of hard squash like acorn, butternut, or kabocha squash. Then she uses a green veggie like green beans, broccoli, brussels sprouts, or okra. Mom always adds parsnips because they are a good source of fiber and protein. 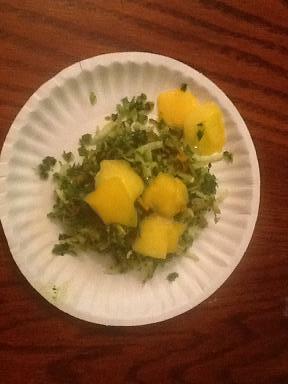 After the greens, squash, green veggie, and parsnip, then she will add whatever is in season or available at the time. We don’t like to eat the same old food every day so she just gets other stuff that is on the approved list of iguana food (link under Resources tab). Then the best part is that sometimes we get fruit added to the salad. Only a little because otherwise we may not eat the veggies. My favorite treats are banana, hibiscus flower, dandelion flower, apple, watermelon, strawberries, and cantaloupe. Wilma likes blueberries a lot and mango. Mom never feeds iguana pellet food from the pet store. Some of these are good and have extra vitamins but some of them secretly contain animal proteins. They are also boring tasting and have to be wet in order for us to eat it. The only prepackaged food mom feeds sometimes is Repti-gel. This is just a veggie/fruit mush that can help an iguana gain some weight or help them start eating again if they lose their appetite for some reason. Every few days mom adds alfalfa powder for protein, reptile vitamin power, or reptile calcium powder. We need a lot of calcium but too much of anything is bad just like in humans. We aren’t that hard to take care of once you learn what we need. But feeding us the wrong foods can make us very sick, so please if you love an iguana take the time to learn what foods are best for us. This was my salad when I first came to mom’s house. That white stuff on top is actually shredded frozen banana! This was Lizzy’s first meal in our house. 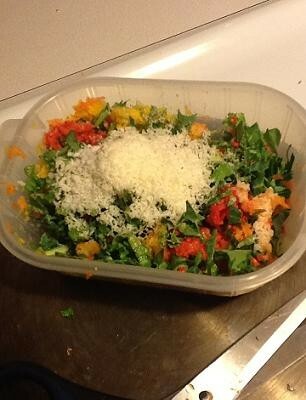 That is mango on top of the salad.